On hot summer days, children in Bellevue, Idaho, love to get on their bicycles and coast downhill to the Big Wood River in order to escape the heat by swimming in the river's cool clear water. Typically, they arrive mid-day to a spot just a block from Main Street, on city land, and adjacent to a nature preserve where a half dozen friends will be playing in one of the best swimming areas near the river—a canal with slow moving water fed by an irrigation headgate. This spot, is a central gathering point for the Bellevue community where, aside from swimming, people of all ages meet to walk their dogs, stroll amongst the cottonwoods, fish for trout, and simply sit to enjoy the sounds of the Big Wood River. Ironically, this community hub is home, not only to the headgate, but also to an antiquated lowhead dam. The dam and headgate are aesthetically unappealing and dangerous cement structures with protruding rebar. At high water they both create drowning hazards—the dam by forcing water into a recirculating wave and the headgate, with the potential for a person or animal to be pinned. The area could be so much better. We can do so much better. With community support we’ve started a project to renovate these structures and ultimately realize the potential that the area has to offer. 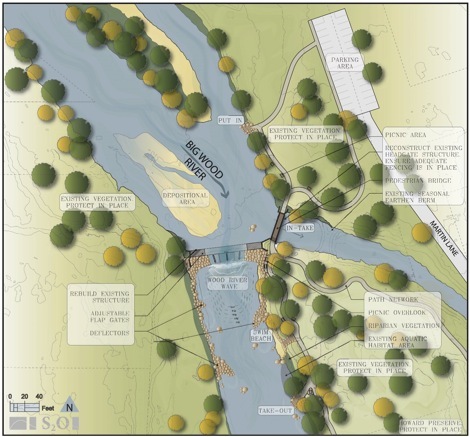 With your support, we’ll transform the park into a wonderful asset for the citizens of Bellevue and the larger Wood River Valley by: updating the diversion with Obermeyer type gates which can be controlled to create a white water play wave most of the year; modernize the headgate to improve its functionability for the Wood River Irrigation District; create new bridge for pedestrian acces over the headgate/canal which will help prevent people from jumping off & into the river or canal; increase fisherman’s enjoyment by improving fish habitat; create safer swimming holes; and create recreational opportunities for tubers, kayakers, and board surfers. All of which will help bring needed revenue to the business owners of Bellevue by increasing use of restaurants, hotels, and other amenities. Please take a minute to learn about our project by clicking through the webpages and reach out to us if you are interested in helping with time, money, or sharing your ideas as this is first and foremost a community based project.